Miniature painting, the art of painting in watercolour on vellum, developed in the early 16th century out of the tradition of illuminating hand-written books. In England miniature was predominantly a portrait art, and was practised by specialist miniature painters such as Nicholas Hilliard (1547-1619). On the Continent, miniature painting as a portrait art had a few great practitioners such as Jean Clouet (1516?-1572), who painted this wonderful portrait. But even Clouet was not a specialist; like Hans Holbein he worked in miniature and in large in oil. This portrait confirms François Clouet’s reputation as one of the great miniature painters. Clouet succeeded his father, Jean, as portraitist to the French court, where he executed chalk drawings and oil paintings as well as miniatures. His method was to make a drawing (like his father, he was an exquisite draughtsman) and to work up the miniature portrait from that first accurate sketch. Catherine Medici (1519-1589) married the future French monarch Henri II in 1533. She became queen in 1547, and after the death of her husband in 1559 was made Regent. This miniature is a rare likeness of Catherine before she became a widow, an event that meant she invariably wore much more sombre clothes of mourning. 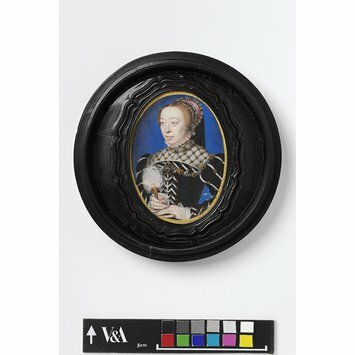 Portrait of Catherine de Medici in an oval frame, half-length, holding a fan. This miniature was received in one half of a 17th century turned wood box: in the other half was a portrait of James I by John Hoskins (P.27-1954). 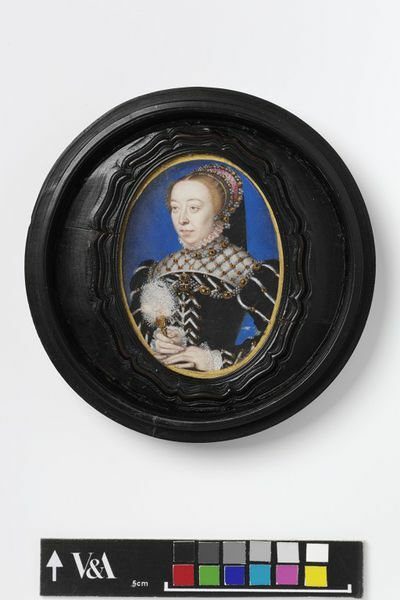 François Clouet, portrait miniature of Catherine de Medici, half-length, watercolour on vellum, mid-16th century. Les Tudors sous la direction scientifique de Charlotte Bolland et Cécile Maisonneuve. Paris : Réunion des musées nationaux-Grand palais : Musée du Luxembourg-Sénat, c2015. ISBN: 9782711862368.